The Holy Dormition Cathedral in Tashkentwas erected on January 31, 1879 in honor of Panteleimon. The building is Orthodox Church of Tashkent diocese. In 1878 the cathedral was rebuilt as there was no enough place for people who came to hold service. The church served as warehouse of hospital until 1945. After the end of war, the building was to perform its primary function. In 1960 the building was renovated. The bell tower of the Cathedral and its dome were rebuilt in 1990. The Patriarch of Moscow, Alexy II made worship in the Cathedral on November 10, 1996. April 11, 2009 is a historic event in the life of the Central Asian Diocese: there was a sound of thirteen new cathedral bells in Tashkent. - Fedorov icon of the Blessed Virgin Mary. - The icon of St. Panteleimon great martyr. - The icon of St. Nicholas. 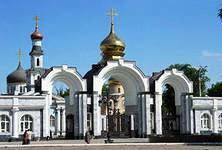 Today, the Holy Dormition Cathedral is a well-organized temple, which includes fountains, benches, flowers and golden dome. Regardless of religion, every believer can enter the cathedral and light a candle to any saint.